John Capuano, Peter Capuano's father visiting from Boston, Andrew Stauffer and Melissa Homestead look over one of the finds. The basement of Love Library North filled with hunters looking to document interesting bits of history in handwritten margin notes, photographs and other objects. The University of Nebraska’s earliest students must have really liked “The Widow Bedott Papers,” an 1856 book-length collection of humorous writings by Frances Miriam Whitcher. 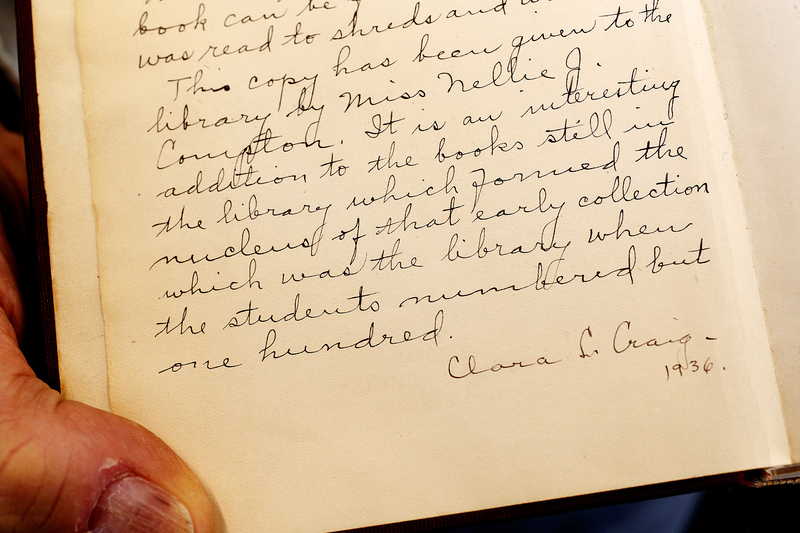 That replacement copy was given to the library by Miss Nellie J. Compton. Mary Ellen Ducey, associate professor of University Libraries, was thrilled to see the find made by John Capuano, who was visiting the university, in the stacks of Love Library March 30. Clara Craig, the university's first research librarian made this notation the book "Widow Bedott Papers" by Frances Whitcher. A group of 15 people, comprised of graduate students, faculty members, staff and visitors participated in a kind of treasure hunt in the oldest general stacks, looking for unique markings, items and annotations. They discovered author inscriptions, gift inscriptions, stamps from various book sellers in the United States and more. But the inscription written by a librarian from nearly a century ago garnered the most attention, because it is a direct link to the past that bears witness to how the university has grown. “It is an interesting addition to the books still in the library which formed the nucleus of that early collection which was the library when the students numbered but one hundred,” Craig wrote. Peter Capuano, associate professor of English and director of the 19th-century studies program, brought Andrew Stauffer of the University of Virginia to campus to lead the hunt, which Stauffer likened to an archaeological dig. “Getting your hands on the books gives you a sense of how complicated and interesting they are as historical objects,” Stauffer said. Stauffer founded Book Traces, a crowd-sourced digital humanities project to identify and document the unique marginalia and items left by readers long ago, and engage the question of the future of the print record in the wake of wide-scale digitization. Most of the books searched Friday were from the 1800s. Capuano and Stauffer described the 19th Century as the golden age of the printed book — when industrial printing was taking off, public education and literacy were exploding and books became more affordable. Ducey said she’d like more searches to identify and reassemble donated library collections through their inscriptions.